AMSTERDAM — 1 Sept. 2015 — Menlo Logistics (Menlo), the US$1.7 billion global logistics and supply chain management subsidiary of Con-way Inc. (NYSE: CNW), today announced a build-to-suit agreement with global industrial real estate developer Prologis, Inc. (NYSE: PLD) for a new 70,000 square meter regional logistics facility in Eindhoven, the Netherlands. 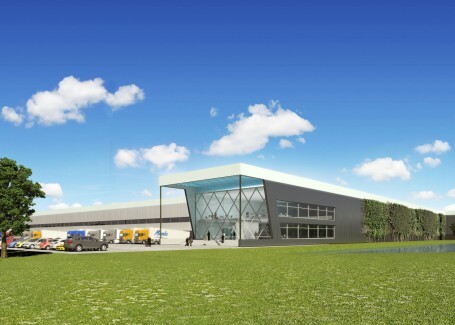 The facility will be located at the Acht industrial park in Eindhoven adjacent to the A2/N2 Eindhoven ring road, which offers direct access to Belgium and Germany, as well as Amsterdam to the north. It will be one of the largest build-to-suit projects in the region. The expansion spotlights Menlo’s commitment to investing in the expanding market for high-value warehousing, distribution and fulfillment services in the Benelux, and its growing prominence as a strategic logistics hub for central Europe. The new Eindhoven facility complements Menlo’s European footprint, which includes a network of 16 facilities throughout Europe staffed by 800 employees. The company services more than 30 European businesses and multinational companies in sectors such as healthcare, fashion and apparel, consumer goods, e-commerce, high tech, industrial manufacturing and automotive. The new 70,000 square meter distribution centre will be a multi-discipline, multi-client facility capable of supporting the local, regional and global supply chain operations of manufacturers, distributors and service providers across a variety of industries. Eindhoven will be one of Menlo’s most advanced facilities, with specific design elements and features to address the stringent requirements of the multiple industries the company supports. The facility also will be capable of delivering other value-added services such as picking and packing operations, product configuration, customized labeling and return management services. More than 200 employees will support the operation. Initial site preparation for the facility began in late July. Construction is scheduled for completion in the first quarter of 2016. Menlo is a leading global provider of logistics, transportation management and supply chain services with operations on five continents. Established in Europe for more than 20 years, the company’s services range from dedicated contract logistics to warehousing, distribution, fulfillment and transportation management, supply chain engineering and other value-added services across multiple industries. Prologis is the leading provider of industrial real estate in the Benelux, with approximately 1.7 million square meters of logistics and distribution space in the region. Menlo also partners with Prologis to lease and operate logistics facilities in Asia and North America. “Our customers expect consistent, efficient, high-quality service, and this new facility, coupled with our commitment to sustainable business practices and Lean continuous improvement, delivers on that promise,” concluded Menlo’s Bianco.